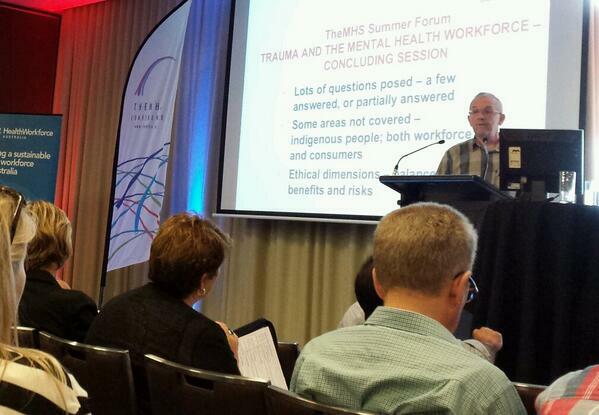 SF14 Session 12: Trauma and the mental health workforce: How the system responds - TheMHS Learning Network Inc.
Having opened TheMHS yesterday, Professor Kevin Gournay CBE also concluded today’s proceedings. At the end of two days, we have been able to cover enormous ground in this field, with the common aim of working towards a mentally healthy workforce that truly provides the best possible quality of care to all. Professor Gournay CBE concluded this years forum with a summary of how today’s mental health care system responds to trauma. He notes the ways in which trauma has been approached from various theoretical orientations, and emphasises that, to date, there is still much left to be understood. Many questions have been posed in this year’s forum, with many answers still yet to be found. Professor Gournay notes that we have had a wide range of speakers and multiple perspectives, and the conference has emphasised the reciprocity of trauma between the workforce and consumers/clients/patients. Workers themselves are often potential consumers, and a mentally unwell workforce has massive implications for the caregiver and the environment of care. Ultimately, the causes and effects of trauma are not clear, though studies suggest that there is a predisposition to react (or not) to trauma. There is also evidence showing a correlation between mental ill health and adverse life events. However, we need to move away from the idea that there is a universal model of trauma. Multiple perspectives give us different insights, but there is no one model that gives us cause and effect and a full picture. At the Government level with more proportionate funding for mental health services. We must also acknowledge how much remains to be explored in this area, and the need for epidemiological studies to allow us to drill down further into these issues. In addition, we also realise that some areas have not been adequately addressed. These include attention to cultural diversity, indigenous people both as workers and consumers, and LGBTI discrimination. We also acknowledge the need for dialogue on the ethical dimensions of balancing benefits and risks in clinical settings, which includes expanding on discussions of restraint and medication. Professor Gournay adds that an understanding of drugs and alcohol is central to addressing trauma for consumers. It is absolutely necessary to put co-morbidity on the agenda as something that must be dealt with by mental health services as an entity. There is also a need to look at co-morbidity in the mental health and drug and alcohol workforce itself. Professor Gournay closed with the key messages of this year’s forum. This includes an awareness that to progress this issue, we need to be open minded. There is a need for everyone to listen to other perspectives including across disciplines. Part of this involves recognising the false dichotomy between consumers and service providers, as a large percentage of the mental health workforce are consumers or potential consumers. Cultivating a mentally healthy workforce will have substantial benefits for quality of care.